We PRAY together; for each other and for all those in need of our prayers and services. We PLAY together; to celebrate and embrace the blessings given to us and our families. set by the CDA mission statement and the goals of our local Court. A Seven Point Program promoting the ideals of Unity and Charity: Leadership, Projects, Life, Youth, Legislation, Education, Spiritual. 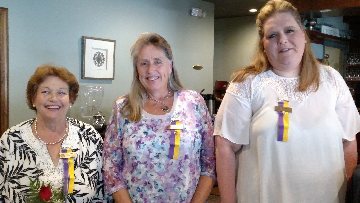 Catholic Daughters of America, Court #2313 wish to welcome our 3 new members! We meet in the "Harrison Hall"